As the final seconds of 2013 ticked away, our attention turned from whatever kind of celebratory beverage we held in our hand toward the topic of what might occur in the year to come. For fans of boxing, the future seemed uncertain; and those of a more pessimistic inclination probably felt they had good reason for viewing it as being rather bleak. After all, at the start of 2014, the rift between promotional organizations and networks seemed as vast and impassible as it ever had at any point since it was first created. The number of appealing match-ups to look forward was rather limited, and the match-ups that had been bandied about (e.g. Floyd Mayweather-Amir Khan) did little to whet the boxing fan’s appetite. Given that context, it becomes easy to understand why some observers felt that the year would prove to be a disappointment. Still, six months later, these fears have proved to be unfounded. Mayweather eventually chose to face the streaking Marcos Maidana instead of Khan; and found himself being pressed every step of the way as the two engaged in a bitterly contested twelve round bout that resulted in a closer-than-expected majority decision victory for the reigning pound for pound king. The sport’s other leading boxer, Manny Pacquiao, faced Timothy Bradley once more, and managed to overcome spirited resistance in the early rounds to grind out a competitive but clear unanimous decision. And Miguel Cotto produced a shocking result by bouncing the reignin middleweight king Sergio Martinez off the mat four times before stopping him to become a lineal champion for the first time in his career. After Froch came off the canvas to score a controversial stoppage of Groves in November of last year, fans of the sport immediately clamoured for a rematch. To the credit of all interested parties, a second match-up was quickly arranged to be held in London’s fabled Wembley Stadium; and once arranged, produced a complete sell out within an astonishingly brief period of time. So it was that on May 31, 80,000 spectators crammed into Wembley to watch Froch and Groves face one another again. It was the single largest attendance for a British boxing match since before World War II. It was the largest attendance for a fight anywhere in the world in two decades. It was covered extensively by U.K. news outlets and for all intents and purposes served as the story of the day for that nation. The fact that it was broadcast by HBO to an international audience- and watched by well over a million subscribers-seemed almost incidental. The fight served as unassailable proof of the fact that boxing as a sport was alive and well; and that rumors of its impending demise had been greatly exaggerated. For that reason alone, it wins this category hands down; and it will take something of colossal magnitude to unseat it as the most important event to take place in 2014. As for the fight itself? Well…it produced an ending that we won’t soon forget; and that will be discussed in greater detail in our next topic. The first six months of 2014 produced its share of aesthetically pleasing, and often devastating knockouts. Notable among them was Amir Imam’s knockout of fellow undefeated prospect Jared Robinson courtesy of a single right hand that sent the victim hurtling through the ropes, out of the ring and to the arena floor. Another leading candidate was Andy Lee’s demolition of John Jackson; with a sidewinder right hook that sent Jackson into an involuntary face-plant just when it seemed as though he was ready to score a stoppage of his own. But, as impressive as these (and other) knockouts were, there’s really only once plausible choice to pick for this category. 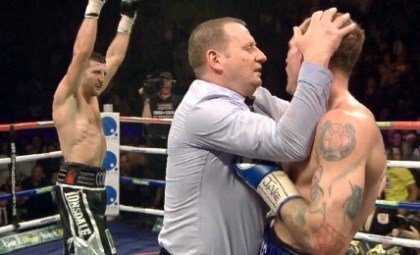 That pick was Froch’s one punch KO of Groves in a fight that’s already been deemed to be the Biggest Event of the first half of 2014. Still, even if this KO had occurred in a less significant contest, it would still be a leading candidate for this award. For starters, it occurred at a point when the outcome was in doubt- and during a round where Groves was enjoying a fair amount of success. It was also set up brilliantly by The Cobra; who used a superb feint to freeze his foe along the ropes, and then proceeded to lower the boom with an overhand right after diverting his foe’s attention with a throwaway left. The right hand connected full force against Groves’ chin, and sent him crashing hard onto his back with one of his legs folded up beneath him. At that point, the official immediately stopped the contest without counting; but a ten count seemed completely unnecessary given the manner in which “Saint George” had fallen. Froch’s KO of Groves was therefore as dramatic, devastating, and aesthetically pleasing as any other that has occurred thus far, and it occurred in the most notable fight of the year to date. That’s more than enough reason to award it this category- and to establish it as a clear contender for Knockout Of The Year once 2014 comes to an end. This was the penultimate round in what had a been a wild, back-and forth battle throughout the course. Coyle, a British boxer competing in his home town of Hull, had suffered three knock-downs at the hands of his Argentinian opponent going into this stanza; and while he had come back and returned the favour later in the fight, it was apparent to everyone in the arena that he needed to produce something dramatic in order to secure a victory. That said, the visitor didn’t seem willing to leave matters to the whims of the judges and when the bell rang for the eleventh, immediately marched forward with the intent of carrying the fight to his opponent. Initially, this aggression paid off, for Brizuela was able to hurt his opponent with a nasty hook to the liver; he then swarmed over his foe, landing another body shot that sent Coyle crumbling to his knees. Tommy managed to get up at nine, with an anguish written all over his features-and then proceeded to uncork a monstrous right hand that connected flush against his opponent’s jaw as the latter moved in for the kill. Brizuela pitched forward to the mat; and was on pins and needles as the climbed back to his feet. Coyle then stormed after his wounded opponent, and after tracking him down, deposited him onto his back with a couple more right hands. Once again, Brizuela dragged himself off the canvas, and desperately hung on as Coyle went into a free-swinging frenzy in an effort to finish matters. Unfortunately for the Yorkshire native, his impatience got the better of him, and resulted in a point deduction after he slugged Brizuela with a punch on the break. This provided Daniel with the time needed to survive to the end of the round which, appropriately, ended with the two exchanging power punches. Other rounds have produced thrills in their own right, of course. Juan Manuel Lopez rose from the canvas in the second round of his rematch with Daniel Ponce De Leon to return the favour twice and then stop him later in the frame. Along the same lines, Thomas Williams Jr. exchanged knock-downs with Cornelius White before stopping him in a one round shoot-out. And, while Terence Crawford wasn’t knocked down, he was wobbled badly in the ninth round before roaring back to score the final two knock-downs of Yuriorkis Gamboa. Still, the eleventh round of Coyle-Brizuela was so tumultuous, and so exciting that it stands as the leading candidate for Round Of The Year thus far. 2014 has produced a number of excellent contests thus far. We’d be remiss to ignore the fact that Mayweather-Maidana was consistently entertaining. To a lesser extent, Pacquiao-Bradley II was, as well. Robert Guerrero’s twelve round fire-fight with Yoshihiro Kamegai produced plenty of sustained action and a number of breath-taking exchanges. The aforementioned Coyle-Brizuela produced a total of eight knock-downs, along with enough twists and turns to satisfy even the most ardent fan of “Game Of Thrones”. But, in the end, two battles ultimately stood out as being the leading contenders in this category. The first candidate was Lucas Matthyse’s eleven round stoppage of inspired underdog John Molina in late April. In that fight, The Machine had to rise from two knock-downs in the first five rounds, and then batter his opponent to the mat three times in the second half of the fight to final secure a stoppage. Even then, Molina stood his ground in the face of his opponent’s advance, and fired back with hard power punches until he could no longer remain standing in the face of The Machine’s relentless assault. The second choice was Terence Crawford’s thrilling stoppage of the brilliant but mercurial Yuriorkis Gamboa in a battle of unbeaten fighters. While Crawford, as previously mentioned, didn’t have to rise off the mat at any point, he did have to overcome an early deficit on the cards after the Cuban stormed out to an early lead. And, even after gaining control and scoring two knock-downs, the Nebraska native was forced to dig deep after being stunned early in the ninth round. As was previously discussed, he was indeed able to do just that, which is a large part of the reason why this contest warranted consideration for this award. In truth, there really isn’t much to separate the two leading contenders for this honour. Matthyse-Molina featured a more even distribution in terms of knock-downs, and probably featured more pronounced moments of pure unadulterated bursts of violence and mayhem. Crawford-Gamboa was fought at a higher level of skill throughout the contest-indeed, it begin as a high-speed chess match-and was arguably the more significant of the two contests. Plus, it contained a Mongoose vs Cobra dynamic that held the viewer’s attention at all times. It’s an apples-and-oranges, pick-what-you-like situation; and there are perfectly justifiable reasons for choosing either contest as the winner of this category- or simply declaring a tie between the two. That being said, Crawford vs Gamboa, at least in the mind of the author, shades this category by a razor thin margin. This is simply due to the fact that Gamboa remained dangerous right up until the end, while Molina was more or less reduced to a punching bag during the last two or three rounds of his fight with Matthyse. For that reason alone, it secures the win in a category after much deliberation on the part of the author. Before we discuss what Crawford was able to accomplish, let’s take a moment to deliver some much deserved praise to a couple of other fighters who enjoyed considerable success over the course of the first six months. Two time Olympic Gold Medalist Vasyl Lomachenko was able to extend a much more experienced and larger Orlando Salido to a twelve round split decision loss at the beginning of March; and followed up by scoring a convincing win over the undefeated Gary Russell Jr. to win a featherweight world title inn only his third professional contest. Meanwhile, Chris Algieri began the year by scoring a minor upset victory over tough fringe contender Emmanuel Taylor, before scoring a major upset of the much feared Ruslan Provodnikov to win a version of the junior welterweight crown. Impressive achievements to be certain; but the fact remains that Lomachenko did suffer a defeat in one of his fights, while many observers felt that Algieri was lucky to receive the nod against Provodnikov at the end of their twelve round battle. While the author is of the opinion that the decision could have gone either way, the controversial nature of the decision prevents Algieri from eclipsing the accomplishments of the man who ultimately emerged as the clear winner in this category. For, no fighter was able to score two victories that were as clear and as impressive as those recorded by Terence Crawford this year. In March, he traveled to Scotland to dethrone local hero Ricky Burns in order to claim the WBO lightweight title, before facing Gamboa in front of over ten thousand supporters in his hometown of Omaha. In each of these contests, he was able to find ways overcome his foe’s resistance and to implement his own offensive attack. In each of these fights, he was able to overcome adversity of one sort or another to emerge as a clear victory. As a result, Crawford is no longer considered to be a a largely untested contender, but is now regarded as being one of boxing’s rising stars. We’ll see what Crawford is able to accomplish going forward, but as of right now, he’s enjoyed the best year of anyone in the sport thus far. These were among the best moments to have occurred in the sport of boxing thus far. It should be noted, however, that not every moment was positive. In early February, a promising twenty-three-year-old featherweight named Oscar “Fantasma” Gonzalez succumbed to injuries suffered in a loss to Jesus Galicia. In may, we mourned the loss of one of the sport’s most beloved warriors, light heavyweight legend Matthew Saad Muhammad, who died at the comparatively young age of 59 after spending time on the street following the end of his career. Their deaths were a stark reminder of the risks that every fighter takes when they step inside the ring; and of how quickly their fortunes can change once their time in the ring is done. Yet, while we shouldn’t forget Fantasma or Saad, we can still take a look back and acknowledge that there’s been cause for celebration for boxing fans in the first half of 2014. More to the point, there are some upcoming match-ups that have the potential to produce fights that are just as exciting as those that were previously described. Daniel Geale is set to provide Gennedy Golovkin with the latter’s toughest test (at least on paper) to date. Kell Brook and Shawn Porter will meet in Augaust in a battle of undefeated welterweights. Undefeated pound for pound entrant Roman Gonzalez will challenge the lineal flyweight champion Akira Yaegashi in early September; and one week later Mayweather and Maidana will renew acquaintance. And, of course, we’d be remiss not to mention tonight’s upcoming bout between Mexican superstar Canelo Alvarez and the ultra-smooth Erislandy Lara, which could prove to be the most exciting fight of them all. …And, to believe that at the end of 2014, we’ll be able to raise that glass in celebration once all is said and done. Previous boxing news: Saul Alvarez vs Erislandy Lara: Keys to Victory, Four to Explore, & Official Prediction! Next boxing news: Shawn Porter To Defend Against Kell Brook Aug. 16 on SHOWTIME At StubHub Center in Carson, Calif.